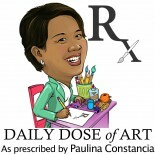 Welcome to a new week on Daily Dose of Art! This week I bring you “Santa, Snow and More in the Tropics”. 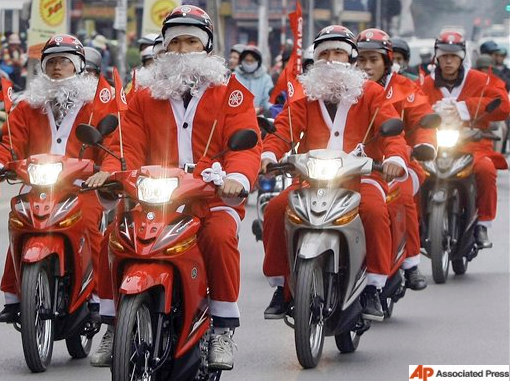 Today we travel to Vietnam and check out the multitude of Santas and their ‘reinbikes’. Today’s feature was inspired by our Christmas holiday in Vietnam in 2010. The first thing I noticed when we arrived in Ho Chi Minh City was the incredible number of motorbikes on the road. I mean you don’t even see the road anymore, you just see the motorcycles. It’s that many. And if you want a rough figure, here goes—there are about 5 million motorbikes in Ho Chi Minh alone. And think about this number in proportion to the city’s population of 7 million. And during the Christmas week, almost every kid riding on a motorbike (with his parents, of course) is dressed as Santa. No other place in the world takes the Santa business as seriously as Vietnam. As you can see from the photos below, it’s not just the kids that are garbed in St. Nick’s red suit (& flowing white beard) even sales and delivery personnel cruise the streets of Hanoi in their santa costume. Young children love receiving Christmas presents from Santa Claus. In the West, children usually prepare a stocking on Christmas Eve night for Santa to stuff presents in. In Vietnam, there is often no stocking. The “Vietnamese” Santa Claus believes in going the extra mile and personally hands presents to the children. Parents often buy Christmas parents and pay a little extra to have them delivered to their children on Christmas Eve by the store’s in-house Santa Claus. 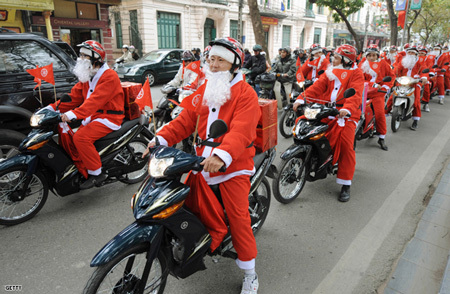 It is common to have multiple sightings of Santa Claus(es) on motorbikes in major cities in Vietnam on Christmas Eve. They may not always have the Santa belly but they definitely have the presents. This entry was posted on December 3, 2012 by Paulina Constancia in Imagine and tagged Christmas, world cultures.